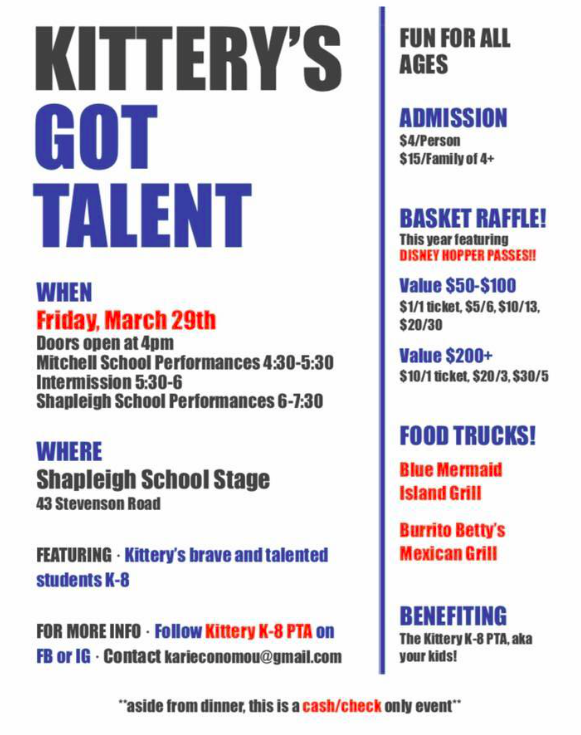 Kittery's Got Talent, featuring Shapleigh School and Mitchell school students, takes place on Friday, March 29. The biggest fundraiser of the year for the Kittery K-8 PTA, the Shapleigh doors will open at 4pm. Mitchell students will perform from 4:30-5:30pm, and Shapleigh students from 6-7:30pm. Admission is just $4 per person, or $15 for a family of four or more. For more information, visit the Kittery K-8 PTA on Facebook or Instagram, or email Kari Economou.